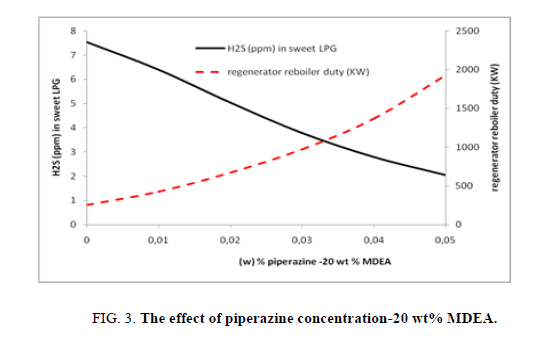 The main aim of this study is to investigate the effect of the use of piperazine as an additive on the MDEA solutions which is already used to sweeten LPG from H2S and CO2. ASPEN HYSYS is used to simulate this case study. In this article many design criteria (MDEA concentration, piperazine concentration, amine solution flow rate etc.) are studied. The composition and operating conditions of pressure and temperature of LPG to be treated is taken from literature and slightly modified, in such situation the composition of our LPG Feed can be considered as theoretical, the flow and the other operating parameters of AGRU (Acid Gas Removal Unit) are also optimized. The liquefied petroleum gas (LPG) plays an essential role in current human’s life; LPG is used to minimize air pollution in comparison with classical fuel. The big demand of LPG makes its production increasing and the need to more efficient and economic treatment is also increasing. The common LPG’s contaminants are CO2, H2S, mercaptans, COS, CS2 and elemental sulfur. Since its vapor density is bigger than 1 hydrogen sulfide gas tends to settle in low places and creates a toxicity hazard . The hydrogen sulfide cannot be released directly from regeneration tower to atmosphere. To recuperate the elemental sulfur, firstly the LPG needs to be treated to liberate the hydrogen sulfide. This is usually achieved by dissolving the hydrogen sulfide in an aqueous amine solution. After regeneration of rich amine solution the hydrogen sulfide is released in the head of the regenerator. The atmospheric pollution caused by the released hydrogen sulfide could be mitigated by sending the released hydrogen sulfide to flare or incinerator to be converted to less harmful/toxic gas after oxidation in form of SO2. Even the directives control environment are less severe for SO2 in comparison to H2S, but both are harmful for the environment; the allowable amounts of pollutants to be released are also limited by environmental regulation [2,3]. If contaminants’ concentration is important, direct conversion of acid gas seems to be the most appropriate solution to eliminate hydrogen sulfide and produce the elemental sulfur. Instead of monoethanolamine (MEA) or diethanolamine (DEA), currently methyldiethanolamine (MDEA) appears to be the most used solvent for hydrocarbon sweetening. Generally, MDEA is chosen for its appropriate qualities, such as its great resistant to chemical and thermal degradation, it’s basically noncorrosive properties and its low specific heat and reaction heat with H2S and CO2 . In such case, an activator as piperazine (C4H10N2) will be used to enhance the efficiency of the global system to eliminate maximum hydrogen sulfide with minimum energy consumption. In this article, the effect of piperazine adding in small concentration will be studied for LPG treatment. For small concentration of acid gas, caustic wash is widely used as treatment method. If high amount of contaminants are present, treatment with amine seems to be the most cost effective process. In this work an ordinary scheme for acid gas removal unit will be used when the extraction is done in liquid-liquid extractor and then the regeneration of rich amine will be done in the regeneration column. As illustrated in the Table 1, The MDEA is considered as the most advantageous amine for hydrocarbon sweetening, because of its lower vapor pressure, lesser corrosive, its wide range of operating conditions, its lower reaction heat and its selectivity towards H2S when CO2. In the last decades many formulations and blends of amine are provided to improve the capacity and the efficiency of sweetening operation within an activator. One of the most activator widely used is the piperazine. The effect of varying piperazine concentrations (from 0 to 5 wt%) will be studied within three fixed MDEA concentrations: 20 wt%, 35 wt%, 45 wt%. Based on the equilibrium, a minimum flow rate will be calculated after choosing the appropriate concentration of MDEA within recommended interval of concentration. In our simulation, the combination of 35% weight of MDEA and 5% wt Pr was chosen [4-6], shown Table 1. Table 1. Typical operating conditions and data for amines. For maintaining the LPG at liquid state; its treatment will be done within an optimum interval of temperature and pressure conditions. The optimum operating temperature should be less than bubble point at the operating pressure (less than 80°C) and at the same time, it should be higher than certain value to minimize the amine and hydrocarbon entrainment. Generally, for keeping up the viscosity less than 2 centipoises at operating pressure of 40 bar, the temperature should be more than 37.5°C . While the LPG will penetrate the column at 40.21 bars and 45°C, the lean amine will be feed the column at the same pressure but an additional of 12.5°C temperature than that of LPG is recommended for good separation. The software ASPEN HYSYS V8.8 is used with new equation of state (EOS) to simulate the acid gas removal unit. Amine property package is replaced by Acid gas Property package. both of property packages cannot be used in our case study, The acid gas property package is limited to gas treating by using an ordinary absorber column as unit operation; whereas treating LPG by liquid-liquid extraction cannot be done by using this equation of state (EOS) which is our case (Figure. 1). 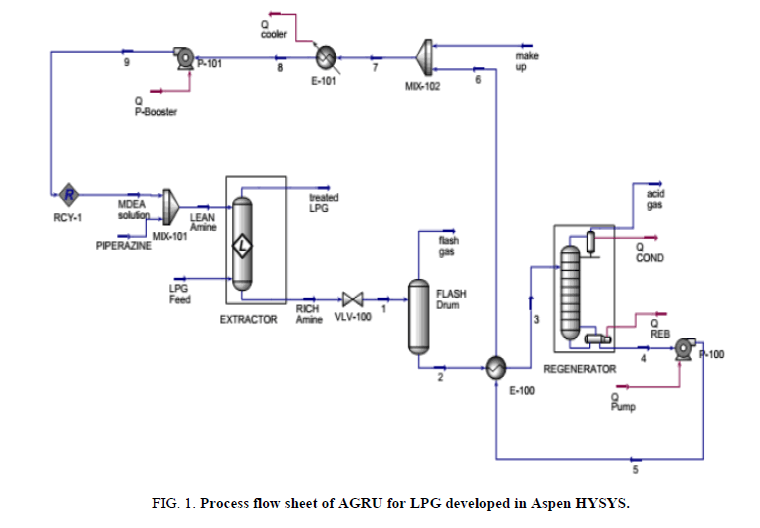 Figure 1: Process flow sheet of AGRU for LPG developed in Aspen HYSYS. At the same time, amine package doesn’t support the piperazine component which is also the case for our study. For these two reasons, the basis of our simulation will be based on DBR amine package as equation of state (EOS), with this property package we can use liquid-liquid extractor and we can use normally piperazine component which can be supported by this property package. The solvent is supposed to be delivered as a concentrated solution comprising MDEA and the activator. The activator in our case is piperazine. In our study, an extractor with 10 stages, 100% MURPHEE efficiency is considered. The flow of LPG to be treated is 13000 Kg/h at 45°C and 40.21 bars; this stream will feed the lower side of the liquid-liquid extractor, the upper side will be fed with 4500 kg/h of lean amine solution (35 wt% of MDEA and 5 wt% of piperazine) at 50°C and 40.21 bars. The temperature of lean amine solution should be well controlled to avoid LPG evaporation . The rich amine loading (mole of H2S/mole of MDEA) considered in our case study is about 0.04511. It has been taken such small rich amine loading parameter just for being able to vary the study’s parameters to be capable to do case studies in large interval of each varying parameters (LPG mass flow, LPG temperature, lean amine mass flow, lean amine temperature…etc.). case of choosing a higher rich amine loading, for example 0.20 mole of acid gas/mole of MDEA the circulation rate will be about 1600 kg/h. This flow of lean amine/piperazine solution can treat no more than the specified flow rate of LPG which is 13000 kg/h. So, in the case study of variation of LPG mass flow, we will face a problem that this amount of amine is limited to a maximum of 13000 kg/h for LPG. The same problem will emerge for the other parameters. The rich amine leaves the extractor to feed flash drum to eliminate some dissolved hydrocarbon and H2S after leaving the expansion valve. After the flash drum, the rich amine solution will be heated to attain 90°C via shell and tube heat exchanger. The last is used to get the heat of hot lean amine leaving the bottom of regenerator. The rich amine solution is then feed the regenerator to be stripped to remove the hydrogen sulfide gas. H2S removal efficiency and regenerator reboiler duty were investigated by varying process parameters, namely MDEA concentration, piperazine addition, on account of water when MDEA is always fixed 35 wt%, weight% piperazine, lean amine solution and LPG Feed temperature, amine circulation rate and the temperature of rich amine which feed the regenerator. The study will be based on some criteria, which should be maintained for all case studies and only one parameter will be changed when the others are fixed as it is given in the heat and material balance table (Table 2). Table 2. Heat and material balance table for the AGRU. In our study, the same approach has been followed for all cases studies, changing the MDEA content, while the other parameters are keeping up fixed. The increase of MDEA concentration will enhance the elimination of hydrogen sulfide, which means the increasing of hydrogen sulfide content in the sweet LPG. In the same time of increasing the MDEA’s concentration, the duty needed to regenerate this more concentrate rich amine is also increasing (from 859 kW to 2251 kW). Here with this case study it is clear that after eliminate the big part of hydrogen sulfide, the effect of raising the MDEA’s concentration is insignificant. Passing from 20 wt% to 45 wt% of MDEA will improve the elimination of hydrogen sulfide from LPG by 1.45 ppm (passing from 5.28 ppm to 3.84 ppm) (Figure. 2). Figure 2: The effect of MDEA concentration. With this case study 20 wt%, 35 wt% and 45 wt% aqueous MDEA solutions are used as basic cases and all the other process parameter are conserved constant, only the concentration of piperazine is changed from 0 to 5 wt%. Within this case study the MDEA concentration is fixed to 20 wt%, when the piperazine’s concentration is varied from 0 to 5 wt%. Figure. 3 shows that the increase in piperazine concentration enhances the hydrogen sulfide (H2S) recovery so the concentration of H2S in treated LPG will decrease from 7.5 ppm to 2.1 ppm. 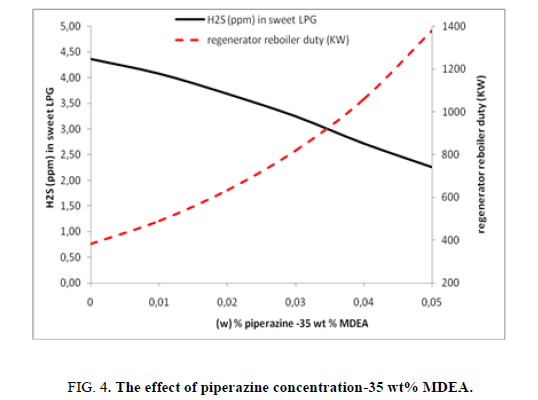 In the same time the duty of regenerator reboiler is increasing from 250 kW to 1925 kW passing from 0 wt% to 5 wt% of piperazine will improve considerably the elimination of hydrogen sulfide from LPG (5.5 ppm) in comparison of effect of MDEA solution (Figure. 3). Figure 3: The effect of piperazine concentration-20 wt% MDEA. As the precedent case study the effect of piperazine’s concentration is studied within fixed MDEA concentration, in this case 35 wt% MDEA is considered. As well as seen in the previous case study the same behavior is remarked when increasing the piperazine’s concentration. Figure. 4 illustrates that the rise in Piperazine concentration enhances the hydrogen sulfide (H2S) recovery so the concentration of H2S in treated LPG will decrease from 4.36 ppm to 2.25 ppm. The duty consumed in regenerator’s reboiler increases considerably when it passes from 382 kW to 1380 kW with the increasing of piperazine concentration from 0 to 5 wt%. Figure 4: The effect of piperazine concentration-35 wt% MDEA. 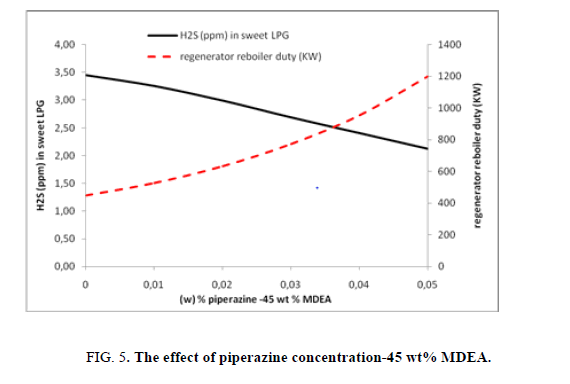 Passing from 0 wt% to 5 wt% of piperazine will improve considerably the elimination of hydrogen sulfide from LPG (2.11 ppm) in comparison of effect of MDEA. In this case it has been seen that the efficiency (elimination of H2S and energy consumption) of global system has improved in comparison with the case of 20 wt% MDEA. Varying piperazine concentration when the MDEA concentration is fixed at 45 wt%, in this case also the use of piperazine pushes the global capacity of the amine solution to eliminate more hydrogen sulfide from LPG (fr om 3.45 ppm to 2.12 ppm) here within this case study the need for energy is less than the other two previous cases when MDEA weight concentrations are 20 wt% and 35 wt% but with more consumption of MDEA (high concentration of MDEA solution) (Figure. 5). Figure 5: The effect of piperazine concentration-45 wt% MDEA. The impact of increasing the mass flow of row LPG, more or less constant when looking to important increasing of row LPG mass flow (Figure 6), this is due surely of extra-capacity design of the unit, The rich amine loading mole of acid gas/mole of MDEA considered in this design is very weak for the normal operating LPG mass flow (0.045) thus lead the sweetening unit is able to remove more acid gas from LPG. 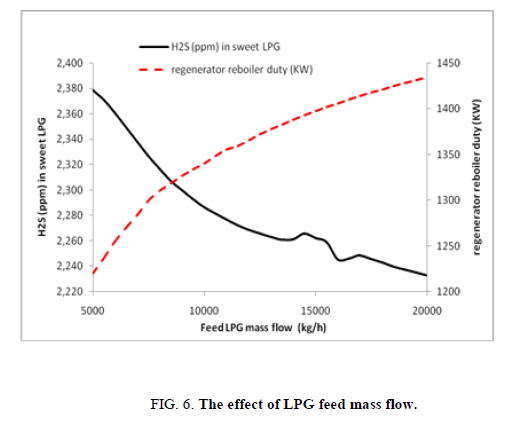 Figure 6: The effect of LPG feed mass flow. Within this case study it has been remarked that the increase of LPG temperature increase the capacity of amine/piperazine solution to eliminate the acid gas, the H2S content in sweet LPG drop from 3.26 ppm to 2.2 ppm, while increasing LPG temperature from 30°C to 42°C, this behavior changes drastically when LPG temperature is more than 42°C, this is of course due to the exothermic nature of absorption reaction and as in the case study of varying the temperature of lean amine, the duty in this case study has been decreased (passed from 1386 kW to 1376 kW) (Figure. 7). 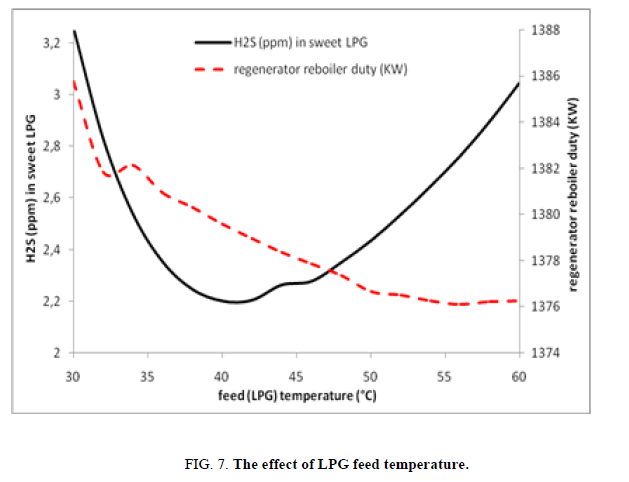 Figure 7: The effect of LPG feed temperature. 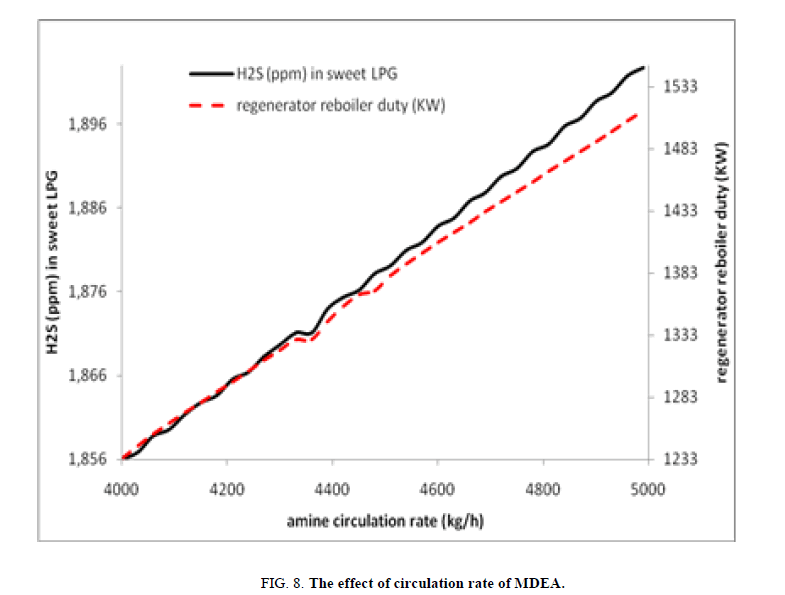 In this case study the circulation rate of piperazine/MDEA solution is studied, the effect of rising of piperazine/MDEA solution circulation rate has a negative impact on the efficiency of the hydrogen sulfide elimination, so this increasing the circulation rate decreases the capacity to remove the acid gas from the LPG; the explanation of such situation is that the residence time is decreasing. Pass from 1.85 ppm to 1.90 ppm. 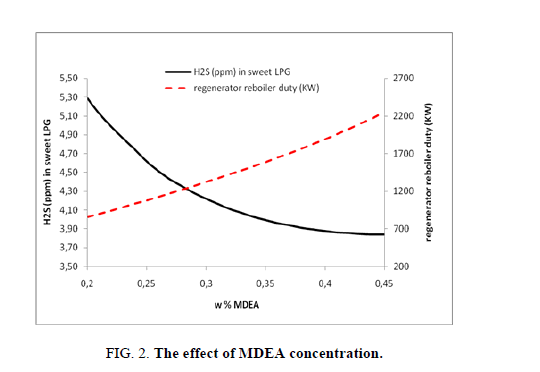 With our case study it is clear that the increase of circulation rate of the MDEA/piperazine solution increases the demand on duty for the regenerator‘s reboiler passing from 1234 kW to 1513 kW (Figure. 8). Figure 8: The effect of circulation rate of MDEA. As the other parameters, temperature of lean amine is changed in order to discover its impact on the extraction of H2S, in this case study it has been noticed (Figure. 9) that the increase of temperature of lean amine/piperazine solution lead to increasing of the H2S concentration on the treated LPG which is due to the exothermic reaction of absorption, the H2S content in sweet LPG raise from 1.59 ppm to 2.89 ppm. The last is of course favorable in low temperature. In the same time the increasing of lean amine/piperazine solution temperature affect very slightly the need on the reboiler duty of the regenerator (passed from 1344.30 kW to 1343.48 kW). 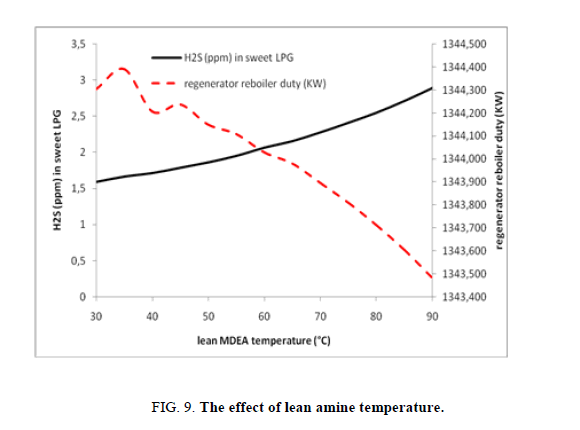 Figure 9: The effect of lean amine temperature. The increase of rich amine/piperazine solution temperature is an enhancing parameter of energy consumption (reduced from 1376 kW to 1253 kW) while isn’t for the content of rich amine/piperazine solution on hydrogen sulfide, so with this an optimum between saving energy and rich amine piperazine solution loading should be well specified and in our study case this optimum is to operate between 90°C and 95°C (Figure. 10). 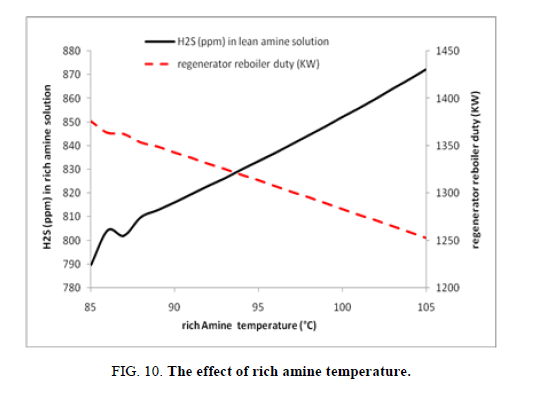 Figure 10: The effect of rich amine temperature. After doing many case studies within the use the mixture of piperazine and MDEA, it has seen that the use of piperazine has enhanced considerably the capacity of the process to eliminate more hydrogen sulfide. Even with weak addition of piperazine of 5 wt%, the global efficiency of the system is highly improved. The use of piperazine as an activator even within small amounts pushes highly the elimination of acid gas from the hydrocarbons to twice (getting 2.12 instead of 3.84). In the other hands it has been remarked that the addition of piperazine decrease also considerably the energy consumption in the reboiler of the regenerator to the half (consuming 1200 kW instead of 2251 kW). In our case study it has been concluded that for the same amounts of piperazine and MDEA, the piperazine is 8 times more efficient then the MDEA in solution at the same time it has seen that the addition of piperazine has a positive impact on the behavior of process versus the energy consumption. Here an optimum between the limit of hydrogen sulfide to be respected in the LPG and the process energy consumption should be searched. Nielsen RB, Daniel F, Rogers J, et al. Treat LPGs with amines. Bryan Research and Engineering, Inc. – Technical Papers. Qeshta HJ, Abuyahya S, Pal P, et al. Sweetening liquefied petroleum gas (LPG): Parametric sensitivity analysis using Aspen HYSYS. Journal of Natural Gas Science and Engineering. 2015;26:1011-7. John P, Texas. Selecting amines for sweetening units. Bryan Research and Engineering, Inc. – Technical Papers. Arthur LK, Richard BN. Gas Purification. 5th ed. 165. Cheremisinoff NP. Handbook of Air Pollution Prevention and Control. 97-8. Arnold K, Stewart M. Surface production operations. Design of Gas Handling Systems and Facilities. 2nd ed. 173. Fleming KB, Spears ML, Bullin JA. Design alternatives for sweetening LPG's and liquid hydrocarbons with amines. Bryan Research and Engineering. Joseph W, Holmes, Michael L, et al. Sweetening LPG's with amines. Bryan Research and Engineering, Inc.